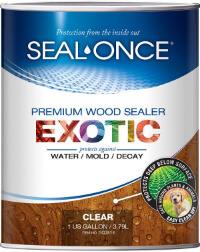 Seal-Once™ Exotic plus Nano Guard Premium Wood Sealer is a deep penetrating, premium wood sealer that is designed for use on all exterior and interior exotic wood surfaces. Seal-Once Exotic can be used on Ipe, Garapa, Mahogany, Teak, Cumaru, Brazilian Cherry, Brazilian Walnut, Tigerwood, Ebony, Rosewood as well as on Thermally Stabilized Wood. Seal-Once Exotic is designed for application on siding, decks, railings, outdoor furniture, fences as well as saunas.